Tickets start at $15. Market pricing applies to all tickets. Prices can fluctuate based on factors that affect supply and demand. Lock in your price and location today! Video cameras and laser lights are not permitted. No audio or video recording is permitted for this performance. Trucks/drivers are subject to change. The Sunday show at 1 p.m. performance of Monster Jam is sold out. 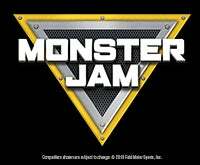 Monster Jam® is adrenaline-charged family entertainment featuring some of the most recognizable trucks in the world including Grave Digger ®, Barbarian and many more. Our world-class drivers push these perfectly engineered Monster Jam trucks to their limits in Freestyle, 2-Wheel Skills and Racing competitions that promise to put families on the edge of their seats in this unexpected, unscripted and unforgettable event! The Pit Party is a pre-show event taking place from 10:30am-12:00pm on January 19 & January 20. Ages 2 & up require a ticket. One of the most exciting ways to get close to the stars of the show – the Monster Jam® trucks and drivers – is at the Pit Party. This pre-show experience provides fans with unparalleled access by providing a fun opportunity to meet the drivers, get up close to the Monster Jam trucks, collect their autographs, take photos and much more! The Monster Jam Pit Party is truly the ultimate experience for any Monster Jam fan, and provides unprecedented access to the stars of the show in a way that you can’t find in any other family entertainment touring property on the planet. PIT PASS MUST BE ACCOMPANIED BY AN EVENT TICKET FOR THE 1PM SHOWS!